Apple and Samsung are back in court (again), this time to settle the damages Apple are owned from the 2012 ruling that Samsung should pay Apple for its copyright infringement of their products. Samsung has vowed to fight last August’s ruling in which the company was found to have wilfully violated seven of Apple’s design and utility patents, including those for the iPad and iPhone, particularly the latter which Apple claims has unique features that Samsung's Android smartphone wilfully steals from. However, in March 2013 the case was resurrected when a US judge determined that jurors had miscalculated the $1.05 billion dollar figure they determined should be paid to Apple, and that another trial is necessary to settle the amount to be paid. This has been refuted by US district Lucy Koh, who presided over the 2012 case. She claims that in order for Apple to again be successful in their claims against Samsung, the company “must prove by clear and convincing evidence that there was an "objectively high likelihood that its actions constituted infringement of a valid patent." But now the plot thickens as Samsung is responding with its own accusations that several Apple products infringe on Samsung’s technology. The case is expected to be the most brutal yet in an on-going saga that finds damage estimates being estimated at amounts from zero to $400 million, far above the amount Samsung were ordered to pay following the original ruling. On 13th November 2013, a jury was picked to begin assessing the total value that Samsung owes to Apple. However, this will be a minor proceeding when compared to the much larger case due to take place in March. That trial will examine newer products which have been only recently released onto the global market, while the November case dates back several years to products that have since been discontinued in parts of the world. Although the case is one of copyright infringement, it’s clear that money lies at the heart of it. In both cases the jury will ultimately have to decide whether Apple actually lost any financial revenue due to Samsung products. Apple became the most popular mobile phone manufacturer when it established the IPhone in 2007, but completion has been fierce ever since, and Samsung’s smartphones sales eclipsed that of Apple in 2011. This feud has been described by some observers as pointless and petty. After all, who is really going to win in this case? Both sides are spending their time battling in court over past products when they should be focusing on their next technological developments to advance their empires further. A number of internet memes have appeared mocking the feud, including one that supports an absurd rumour that Samsung paid their $1bn debt to Apple by sending dozens of trucks to deliver the whole amount in Nickels (5 cent pieces). 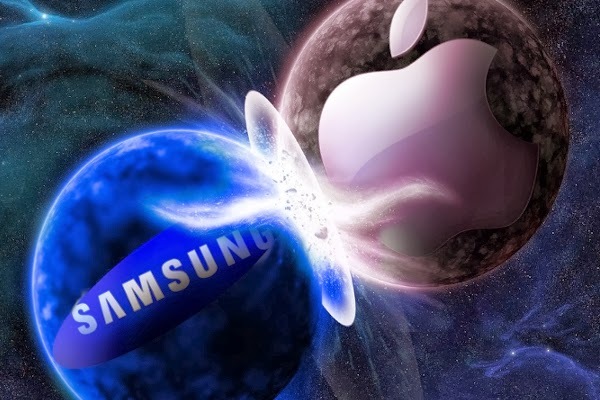 It seems that Apple and Samsung’s lawyers will be true winners in this case. Who do you think will win the case this time? Which company’s products do you prefer? Liam Brennan frequently blogs about the latest mobile phone industry developments. He uses Roaming Expert to find the best roaming deals for travelling abroad.